AMS Services is a railroad company that specializes in hauling over weight over width, product transfer, and flatbed divisions. They are both local and OTR. The company was built from the ground up thanks to dedicated hard working employees with a passion for excellent customer service. The core values at AMS are safety, service, and quality. With safety being at the top of their list, it’s no surprise they put such a high emphasis on constantly improving it; AMS believes operating a safe fleet leads to operating a successful fleet. With 67 different vehicles, the company knew they needed an easy-to-use system with driver safety features in order to make their goal of consistently increasing safety into a reality. They have always strived to do whatever possible to ensure that both their valued employees and company stakeholders are in the safest environment possible. Additionally, managing driver behaviour was also an important factor for AMS to reduce fleet costs. Therefore, AMS saw multiple benefits in investing in a fleet management system. After a bit of research, AMS Services felt that investing in GoFleet and the Geotab GO device would be the ideal solution to meet their needs. The solution that GoFleet provided did not disappoint and AMS Services quickly moved towards operating a much safer fleet. With the help of their account manager and the support team at GoFleet, AMS Services was able to effectively manage their driver’s behavior by setting up specific speeding and harsh driving rules within the system. The user-friendly interface made it easy to visualize their journey towards becoming a safer company over time. 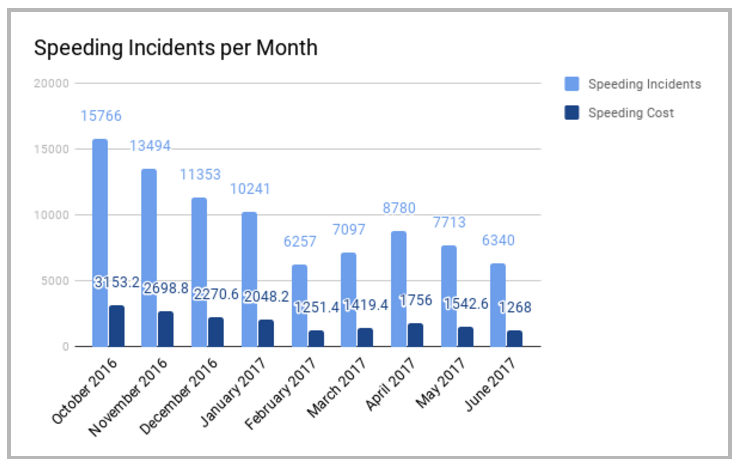 With GoFleet, AMS was able to eliminate close to 10,000 incidents from their speeding incident count (15,766 to 6,340) in a span of only 8 months! Not only did this drastically increase the safety of their drivers, it decreased the cost of speeding from $3153.20/month to $1268/month. In other words, by making their company safer, they have been able to save close to $2000/month on fuel! Speeding was not the only poor driving habit AMS was able to improve. By making the switch from GoFleet’s Base plan to the Pro plan (March 2017), the company was able to receive accelerometer data from their vehicles. This allowed them to begin monitoring even more driver behavior like harsh braking, hard acceleration, and harsh cornering. 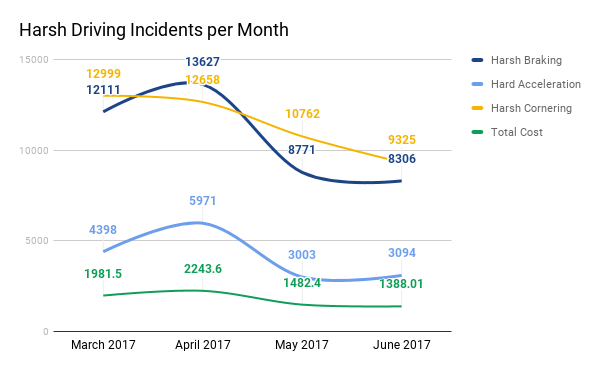 After only four months, the company was able to effectively reduce all of these metrics, and in turn increased the safety of their drivers drastically. This also lead to reduction in harsh driving cost from $1981.50 to $1388.01.